Today, no more pre-orders on Kindle! My latest book finally launched! The wait is over for all you Kindle Fire or Ipad users! I even ordered it myself...wanted to see how it "printed" on the device and here is how a page looks on my Kindle Fire HD, Loving it! Plus, if you have Kindle Unlimited account...you can read it for free! Or with a Prime membership...you can borrow it for free! The print books HAVE been printed, got a notice just yesterday...and they are "preparing them" for shipment. I know some of you can't wait...(I know I can't)...but the E-book is a good way to have the book with you where-every you go. Hugs! Congratulations, Kathy! Your book looks great. I can't wait to receive mine. What a treat for your fans and excitement for you to be published. As a prime member your book will be on my Kindle as soon as I get up Tuesday morning. I received your new book today in the mail. It is AWESOME!!! I knew your book would be good because you are a great teacher, but your new book exceeded all of my expectations!! 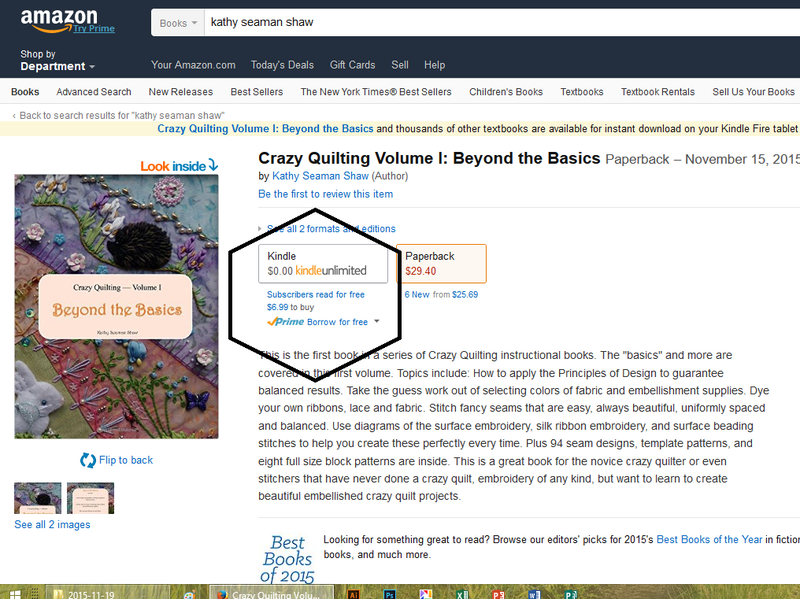 It is very comprehensive and includes all aspects of crazy quilting. I can't wait for Volume 2.